Will Evans is such an enjoyable player to watch. He just always has a positive impact on the game. Tom Youngs had a big impact aswell....carry, carry , carry....and he made yards. GeordieFalcon wrote: Tom Youngs had a big impact aswell....carry, carry , carry....and he made yards. Youngs has improved steadily since Polata-nau arrived. The return to form and fitness of our props around him has seen another improvement too. It's great to see given everything that has gone on. I still think he's a better player without the captaincy, Toomua would be a great choice there, but his performances have been getting back to his best. king_carlos wrote: Will Evans is such an enjoyable player to watch. He just always has a positive impact on the game. No idea why he didn't start. He made more yards than Tino who is at least two stone heavier and just as quick. Massive work rate and good hands. Our bench was considerably better and that told. Smith ran hard and straight which eased the pressure on Ford and Toomua. Their forwards tired and ours kept up the pressure. Good victory and now up to third. Lovely day out at the Gardens. Warriors are absolutely dominating possession...yet our brick wall defence is just knocking them back. COme on falcons we need to battle here...Wuss are totally up for it. Hopefully Falcons can hit back and stop them getting anything ... will give LI a faint hope still given the current score at The Stoop ... sure we can manage to lose it still though. 3 games on the trot now we've been genuinely poor. We cant afford to leave here with no points at all! 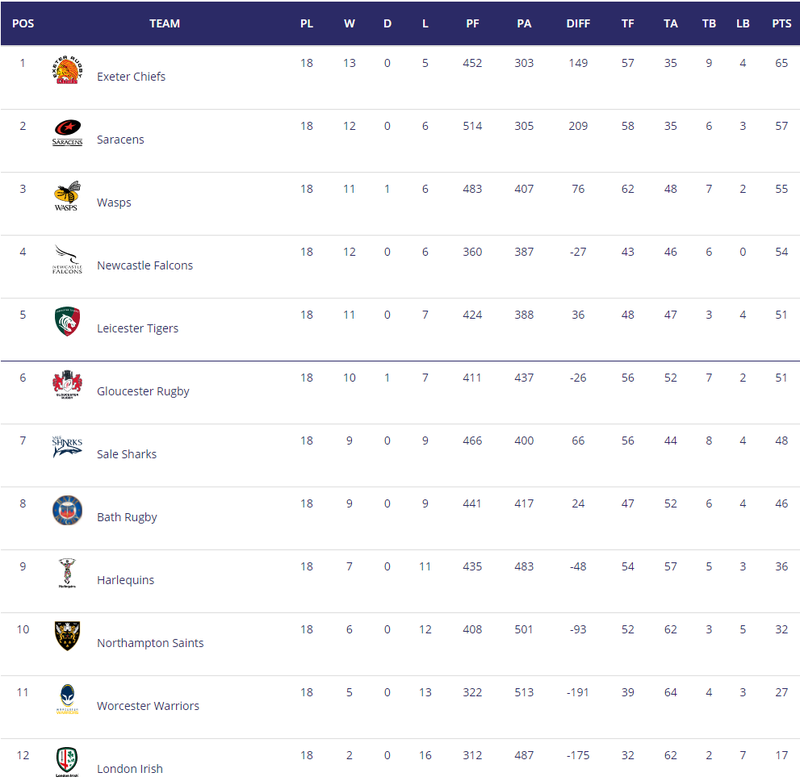 So Tigers 3rd now equal points with Wasps, and 2 points ahead of 5th place Falcons and 3 points ahead of 6th place Sale. Glous a TBP win or win away to Exeter will take them to 5th, but a loss will leave them 5 points behind the top 4. No top four finish for us. We look tired. Maybe going on three fronts has stretched this squad too much .. He was due one. What are Newcastle doing?!? On the upside it helps Tigers top four ambitions. Would have liked to see Falcons knock Wasps down to fifth though. Yes Te’o looked great today - don’t think I’ve seen him play better for Worcester. Denton and Spencer also did well - shame they’re off! Worcester dropped the ball on the line twice so we’re lucky that didn’t cost them more. Newcastle’s defence awesome in the first half - couldn’t see Worcester getting through. Irish playing so hard - really feel your pain. GeordieFalcon wrote: Well humped....and no points! Still GF, compare your season now to this time last year. The upwards trajectory is fantastic. Poor 2nd half from us. We look super tired tbh, I don't think we have the squad to really challenge on 3 fronts and it showed today. Missing Welsh, Wilson and our scrum halfs (who have been on fire) has really hit home at the business end of the season. Haha! Hope it doesn’t come to that Heaf, but supporting a team like Worcester I can also see the attraction of Rugby in Devon! Congrats on today Stub, well deserved win. Your lads were really up for that one in the 2nd half. No complaints mate at all..
Lots of the fans are whinging on the unoffy but I don't see why. We've had a great season. A few injuries recently haven't helped but everyteam has that. we need to realistic where we are...a team competing on a much smaller budget than most and doing very well at the moment. I wanted top 6 this season...as long as we get that ill be more than happy. Cheers Sgt, I could not see us ever getting through the Falcons so I am mightily relieved. Absolutely GF - this is just the start, next season looks likely to bring even greater rewards. As you and SP point out, your squad is suddenly fighting on multiple fronts and therefore greater depth is probably required. I would be very happy if Worcester ever get into the sort of position you are in now. Really hope quins continue to get tonked for the rest of the season, anything to precipitate the departure of the coaching team. Kingston's lost the squad, that much is obvious. Time to see if anyone in charge has the balls to do something. Scottrf wrote: Lovely day out at the Gardens. Yeah my mates a Saints ST holder...hes just been on the phone and said that's possibly the worst half of rugby he has seen saints play in an awfully long time. Not the actual rugby...but he was more alarmed by the complete lack of passion, fight , and said only about 2/3 actually looked like they cared what was happening. I will watch later today or tomorrow morning. At least we can see who have a desire to play for Saints next season and who don't. After a dismal season like this one, now is the time to start setting examples by letting a player or two go. Wanderers had a great season in the A league. So in the organization there are young players playing well enough and anxious to get game time with the top team. Give them a go. Can't do worse than today. doctor_grey wrote: I will watch later today or tomorrow morning. At least we can see who have a desire to play for Saints next season and who don't. After a dismal season like this one, now is the time to start setting examples by letting a player or two go. From what get told by Saints fans the main reason the wanderers are doing well is because the majority of them are not "youngsters". They reckon that once Saints culling finishes the wanderers will have less 25 + year old journeymen and more academy/project players. To be fair, last Wanderers side was mainly young. But would agree generally, it's more of a sign of our recruitment than academy. Worst performace I have seen in a decade. Nothing seemed to work for Quins. Senior players had stonkers (barring Robshaw), Marler and Sinks showed a bit of desire while the rest of the squad looked like they didn't want to be there. Fans were booing at the final whistle.....never really seen that before and its obvious that the squad isn't buying into whatever the coaches are telling them. Quins social media seems in anarchy now. Lots of hate on the FB page. Lots of chat on the Quins board that senior players are unhappy with the coaching team, especially Robshaw and Marler. Marler seems pretty outspoken with his anger too. Jeez I hope they sack the whole coaching team and the inept board who hired this lot. Bring in a fresh team, fresh ideas and some quality leadership. Lets hope that all the jumping up and down generates some results. Most of the posts I have seen have been STH refusing to renew if there aren't changes at the top. A significant drop in STH would surely make the board take notice. Marler was already coming off the pitch looking up at the box shaking his head months ago. It's quite obvious Kingston has completely lost the squad. Sack off Kingston, Mapletoft, Evans, Easter, Jones and any other chancers that are still around because of some misguided loyalty to ex-players, however good they were as players. We've got good players in the squad (give Kingston some credit there)....but the coaches need to go. I hope there's more of a clear out then just JK though. Bath vs Irish Bath win. Yawn. As far as I see it Exeter and Saracens should get home playoffs. Tigers look pretty well set for 3rd and Newcastle Wasps in a real fight for fourth. Bath Gloucester and Sale still have an outside chance of making it. Also flags up boths ides of the playoffs argument. Exeter not winning the title would seem wrong if they do win their last 3 regular season games. But instead of having a tense exciting run in followed by two rounds of closely matched winner takes all games we'd be feeling like the season was pretty much over already and drifting through the last 3 weeks. As it is the top 8 can still all theoreticaly win the title, and the bottom 4 all get relegated (although lets face it...its Irish). All the fixtures currently have an impact on playoffs, relegation and eurpean qualification. Games with meaning are a good thing. Gooseberry you obviously haven't seen our last 3 games...we're struggling. Tiredness, and lack of key players is genuinely affecting us. Apparently Takulua is back for tomorrow v Sale...that would be a massive boost.